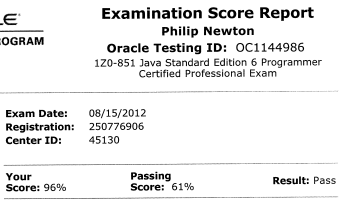 I took the Test Formerly Known As Sun Certified Java Programmer (no idea what it’s called these days; Oracle Certified Professional or some such, I think), and passed with flying colours! So now I wait for the proper certificate, but whee! I is a SCJP! Next step, possibly: SCJD. As in, the test that doesn’t test you on arcane syntax details and API method arguments, but actually makes you develop some software. Kind of like the difference between ivory-tower learning and actually showing you can get your hands dirty and construct something that not only works but was constructed properly. Though a co-worker is shooting for a Java EE Web Component Developer exam next.